(P1) A video on the Internet became viral. It shows a man and a dog on a motorbike. Strangely, it is the dog that is driving. A person filmed the video in Manado, Indonesia. (p2) The man and the dog must be very close. However, they were driving to a place where people famously eat dog. (P3) The man said that a driving dog could seem unusual to people, but that it is completely normal in Indonesia. Do you have a dog? Why or why not? 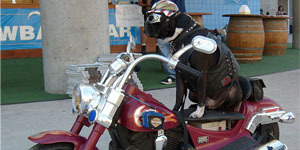 Do you think it’s unusual to see a dog on a motorbike? Why or why not? Have you ever been to Indonesia? If yes, where? If no, do you want to travel there? Which city did this take place in?